Sometimes a music journalist’s ears are rather strained, even tortured. Most of the time the blame can be put upon very young bands that just entered the recording studio much too early. 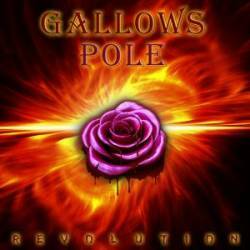 And that’s exactly how Gallows Pole from Austria sound on their current album Revolution. The music’s quality gives the impression that we are dealing with a band consisting of high school students, but in this case we are in the presence of much older musicians. Gallows Pole have so far released five albums between 1982 and now. Maybe the sometimes very long intervals in between records explain the band’s criminal lack of dynamics. Gallows Pole practically fail everywhere. At first I hoped they were just another subpar hardrock band, but the quality dropped with every song, or maybe I just became more impatient. Revolution seems to be built on a single idea that recurs in more or less the same shape all over. This makes for a very monotonous listening experience. Another criticism is the music’s utter lack of pace. You feel like getting up and helping the musicians, just to get the songs started. The dry production comes with a guitar sound that sounds like an emulation from an Eighties home computer. I could go on like this, but it should be obvious by now what impression this record left on me. To sum it up: Gallows Pole should leave the music making to those who are good at it. Revolution has every chance of becoming my least favourite album of the year!